The Michigan Wolverines are set to face the UNLV Rebels tomorrow at noon. The Wolverines enter the game with a 1-1 record, while the Rebels come in at 0-2. The Rebels are coached by Tony Sanchez, last year Sanchez was coaching high school football.... No, really. Michigan was able to move the ball much better last week as the game went on. Everyone saw the typical Jim Harbaugh offense last week, pound the ball and run a consistent offense. 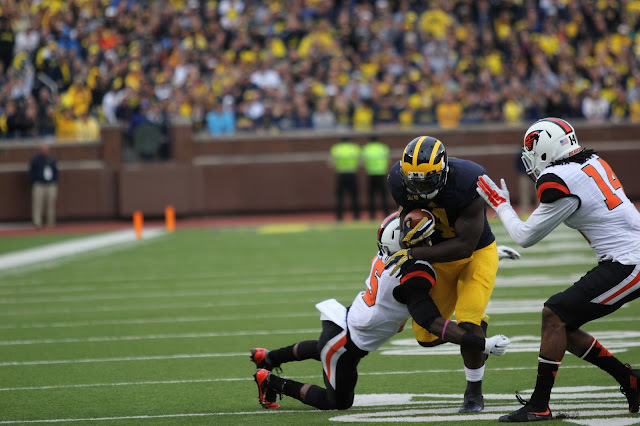 Yes, the Wolverines were facing Oregon State, but overall the entire offense seemed to be in sync. The key for the Wolverine offense is to improve each week. Without a doubt there was improvement from week one to week two, and there should without a doubt be improvement from week two to week three. Drake Johnson made his return from an ACL tear against Ohio State last week, and is expected to have a bigger role this week. I expect to see DeVeon Smith run for over 100 yards, and Derrick Green and Ty Isaac to each gain some added carries, with one of them also eclipsing the 100 yard mark. Rudock will likely put up a similar performance as he did last week, as the passing game will not be needed. For UNLV, quarterback Blake Decker has only thrown one interception, and two touchdowns, and only has completed roughly 51% of his passes. Against a very good Michigan defense, and a good secondary that has huge play ability, I expect Decker to have a very tough time. UNLV has not ran the ball well either. Keith Whitely, the lead running back has gained 141 yards this season, and has not scored a touchdown. While the leader receiver for the Rebels has only 70 yards through two games.The Rebels have scored 33 points total on the season, 30 of which came in an opening week road loss to Northern Illinois. The Michigan defense is going to put on an absolute clinic in this game. It will not even be fair. I expect the Wolverines to put on a defensive clinic in the game, and allow very little amount of yards to the Rebel offense. Chris Wormley will continue his tackle for loss tear he is on, and Jabrill Peppers will finally make a huge defense play that everyone is looking for. The UNLV defense won't be able to hang with the Michigan offense. The running game will be out in full force, and the Michigan play callers won't need Rudock to do much. Wouldn't be surprised to see Malzone or Speight in the game toward the middle of the second half against this Rebel defense. Not much to say here other than I expect Brian Cole to finally block a punt, and we will actually see what Peppers can do on punt returns. Game Prediction: Michigan 45, UNLV 0.